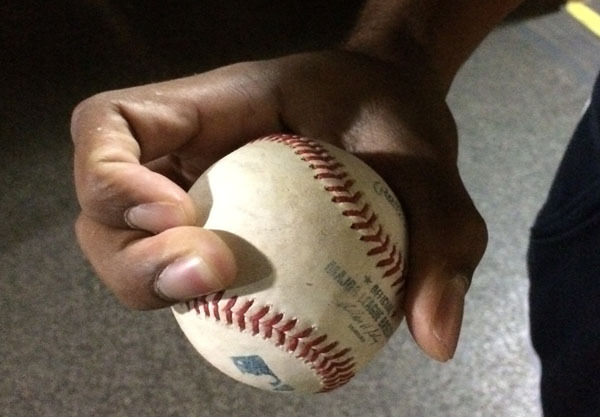 Have you seen Odrisamer Despaigne’s strange crossed-finger grip? I noticed a while ago and wrote about it, and then went on television talking about it, and then was quoted by a colleague, all the while saying that this grip was his changeup grip. It had to be the changeup because I thought I heard that it was and what other pitch could be so weird, and since his change was so strange by movement, it all made sense. Well, I was wrong. And there’s video proof that I was wrong, all embeddable, searchable, and posterized for posterity too. So that pitch? That’s his slow curve. The pitcher even laughed at me a little bit for thinking it was a change, and that it was so strange. Put into the pantheon of curves, the grip starts to look like much more like a knuckle curve, and much less weird. Despaigne doesn’t call it an eephus, but that name fits this grip. And yet, a pitch like that… it’s gotta be weird. Even if the pitcher shrugs and says that’s how he gets it to go so slow, even if it may look like a knuckle curve, even if it’s not a crazy new changeup grip we all have to try — it’s weird. Turns out the pitch is weird, but it probably has more to do with his arm angles and usage than the grip. Call it an eephus (he calls it a slow curve), and it’s already just one of five in the game. But with an average of seven inches of horizontal movement and 11 inches of drop, at 67 mph, it’s not as rare a curve as that designation makes it. Chris Young and Tim Wakefield had slower curves with almost as much drop at different points in their career. Chad Billingsley and Randy Wolf had similar slow curves. Yu Darvish is proud of a slow curve that was almost an exact match for Despaigne’s version. The slow curve in action. But for some reason, people swing at Despaigne’s curves. Last year, the only curve that got a higher swing rate was Yusmeiro Petit’s. More than half the time, batters swung at the Cuban’s many curveballs. And curves have the lowest swing rate in baseball. Despite Darvish’s curve being similar, batters swing at his version barely 40% of the time to Despaigne’s 55%. Ask the pitcher, and he says that it’s about the velocity and usage. “In any count, I use it — they see it’s slow and that’s why they want to swing at it,” Despaigne said through a translator late last season. The numbers don’t seem to show that slow curve balls get more swings, though. The slowest 10% of curves last year got swings 35% of the time, while the fastest 10% got swings 43% of the time. Despaigne is right that he uses it in many different counts, to an extent. The league uses fastballs 65% of the time when they need a strike (0-0, 3-0, 3-1, 2-0, 3-2, 2-1). In those situations they use a curve ball (knuckle curve, slow curve, or curve) 8% of the time. Despaigne uses his fastball 55% of the time in those counts, and uses his curve and slow curve a combined 11% in those situations. That’s not very stark. More stark might be this map, of his release points. The color of each mark is determined by velocity, and each mark is labeled by pitch type. You can check it out here if this is too squeezed for your liking. Maybe these release points are his own sort of personal brilliance. Each slot changes the movement on his pitches — “the fastball here is not the same as down here” — and that basically gives Despaigne even more pitches. Look at how the movement changes in each slot, using PITCHf/x data and classifications. How many different pitches do you count? The sinker and the curve, at least, are very different up top and down low. You could almost make the case that he’s got two different changeups, since the velocity and drop are fairly different depending on his arm slot. Even if you don’t count the change, he’s probably got eight pitches: sidearm sinker, sinker, sidearm curve, curve, slow curve, slider, cutter, change. Two curves from the same 8/6/14 game against the Twins — over the top on the left, sidearm on the right. Another thing you might notice is how often he throws his cutter. He throws it twice as often as his fastball, and admits that he comes to the park on start days to try and figure out which will act as his ‘fastball’ that day. “I read the scouting reports, and then I look at what is working today in the warmup, and then sometimes I change it in the game,” he said. What you end up having is unpredictability. Well, within a range. But have a gander at at what unpredictability looks like. Here is a map of his pitches by horizontal and vertical movement, with velocity determining the color of the mark. Play around with the filter to see which pitches come out of each arm slot. But ask him if anyone told him to pick an arm slot — he does have the third-most inconsistent release point in the game — and he shakes his head. “Since I came here, everyone just likes me to be how I am, I’ve been throwing like this since I was a nino,” he said through the translator. He thinks of it as a strength, not a weakness. And has anyone told him to pick a pitch and focus on it because some of the others aren’t good enough? He shakes his head again and smiles: “I want to add one more.” Once again, the slots and pitches are a feature, not a flaw. Despaigne has made some tweaks since he’s immigrated. When he played in Cuba, his slider was slower, but he worked in Mexico to throw it faster. “I want to throw it faster,” he admitted. Perhaps if it truly looked like his cutter — which is about two to three mph faster right now — and then dropped an extra two inches, perhaps the slider would do better than get the 6% whiffs it got last year (13% is average). There’s something about this unibrowed Cuban with the easy smile and the quirky arsenal. He already came up with one of the weirdest grips in the game — maybe we can trust him to continue coming up with wrinkles. Maybe Despaigne’s kitchen sink just works that way. Thanks to Nathaly Morga-Oregel for her help communicating with Odrisamer Despaigne. We hoped you liked reading Odrisamer Despaigne’s Strange Grip by Eno Sarris!